Stop by your nearest participating Krispy Kreme location for a FREE Coffee (12 oz House Blend). No purchase necessary. In addition, 75 fans will win FREE coffee for a year as part of Krispy Kreme's 75th birthday and coffee-lover celebration - Just enter the giveaway by filling out the simple online entry form! Participating McDonald's restaurants are offering a free small McCafe Premium Roast coffee today. No purchase or coupons are necessary, just stop by the set of golden arches nearest you and ask for your free cup. Kwik Trip is offering a free coffee deal via their text alerts sign-up program, which sends alerts about gas prices and coupons for gas and other items directly to your phone. I received a text that says: "National Coffee Day Sat. Sept 29! Bring in this text for one FREE 12oz Karuba Coffee/Capp!" -- I can't wait to get my free coffee today! 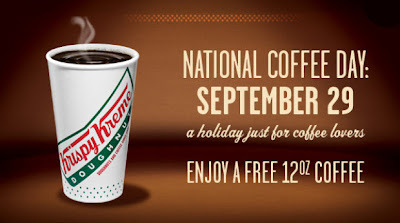 Know of any other deals for National Coffee Day? Let us know!